As I mentioned in my post earlier this week - there's a striking simplicity in the number 3. Using 3 repeated images in a project is simple, but catchy. It looks balanced, but not boring. It's something that just sits pleasing to the eye.... well at least for me it does. 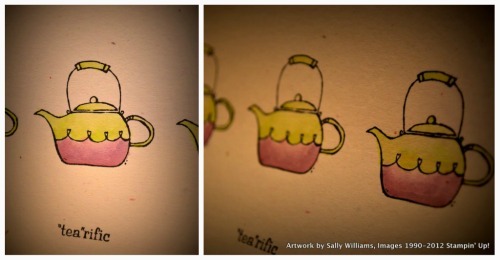 Here's another little card I made using 3 repeated tea pot images from the 'Morning Cup' stamp set. I simply stamped them in black and water coloured them in the same colours. What do you think? I like the simplicity of it. If you're stuck for an idea when you're crafting this is a great technique to try. Why not try it our yourself and leave a comment here with a link. I'd love to see what you're creating.